With spring in full-force (and summer arriving shortly), seasonal vegetables are popping up all over farmer’s markets. One of my favorites is asparagus. The crunchy texture and crisp, earthy flavors of the vegetable makes it great for a variety of dishes. Adding it to quiches, roasts, risottos, pastas, and salads are some of the many ways you can use this vegetable. Not to mention, asparagus has many health benefits, including high levels of Vitamin K and Folate, which promote heart health and strong bones. 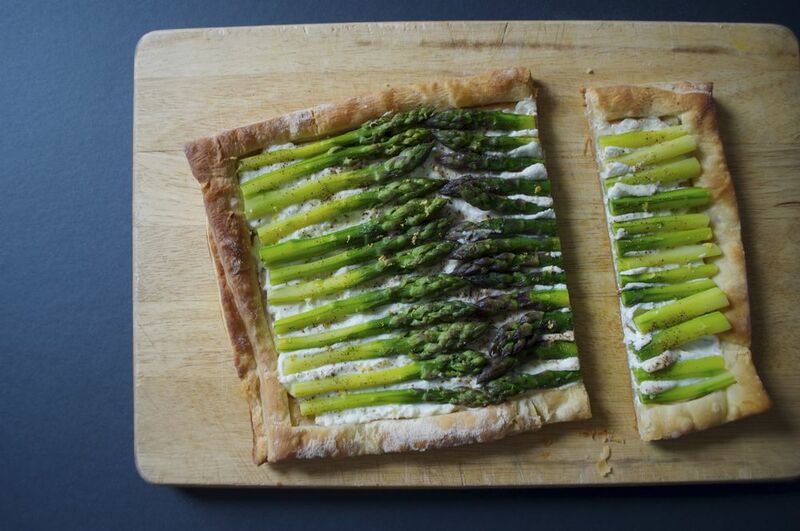 For this recipe, I wanted to create a simple asparagus tart. One that would require few ingredients, showcase the vegetable, be easy to make, and look like you worked all day on it. The dough I use is puffed pastry, which you can buy frozen at the supermarket. The base is a ricotta mixture that is slightly sweetened with honey to create a depth of flavor and act as a binding agent for all the layers. For the asparagus, I decided to blanch it before roasting it in the oven. Blanching is easy to do and is a great way to enhance the flavors, color, and texture of vegetables. Boil the vegetable for a few minutes, then place it in an ice bath to 'shock' it. This will prevent it from cooking further, all while retaining a crunchy texture and vibrant color. I then assemble the asparagus, ricotta, and puffed pastry, and bake it in the oven until golden brown and crispy! The buttery, flaky texture of the dough, combined with the sweet richness of the ricotta and the clean, earthy flavors of the asparagus makes this a meal for the senses! Note: If you don’t like asparagus, you can use any vegetable you have around - tomatoes, zucchini, summer squash, eggplant, or carrots (to name a few). Just keep in mind cooking times vary per vegetable, and whatever you do use, make sure to have fun! When preparing the asparagus, wash, peel, and trim the vegetable. There are many views on where to cut the stem. Many say you should take the two ends and bend until it snaps. The point where it breaks is where the two textures meet - the courser, stalker end and the more tender, flavorful part. Others say to just cut off about an inch from the end. For peeling, I just use a vegetable peeler. Preheat oven to 400 degrees Fahrenheit. Line a baking sheet with parchment paper. Take out puffed pastry and let thaw for an hour. Bring a pot of water to a boil. Prepare the asparagus by washing, peeling, and trimming the ends (refer to articles and text above on how to do this!). Place the asparagus in the water and cook until fork-tender but still firm, about 3 minutes. Prepare an ice bath by placing water and ice cubes into a bowl. Once the asparagus are cooked, remove with tongs from the water and place into ice bath for a few minutes. This will “shock” the asparagus, preventing it from cooking further, while enhancing the color and retaining the crunchiness of the vegetable. Drain, then dry the asparagus using a towel. Once the puffed pastry is defrosted, on a lightly floured surface, roll out the dough into a 9x14 inch rectangle. Using a knife, score the edge of the dough, creating a 1 inch border. Using a fork, poke the inner section of the dough, leaving out the border. Carefully place the puffed pastry onto the baking sheet. In a bowl, mix together ricotta cheese, honey, and juice of 1/2 a lemon Spread the ricotta mixture evenly onto the tart, making sure to stay within the 1 inch border. Assemble the asparagus on top in any design you like (refer to the pictures above for the design I did!). Top with lemon zest, a drizzle of olive oil, and salt and pepper to taste. Place the baking sheet into the oven and bake 25-30 minutes, until crust is golden brown. Serve warm, or at room temperature. Store in an airtight container in the refrigerator.